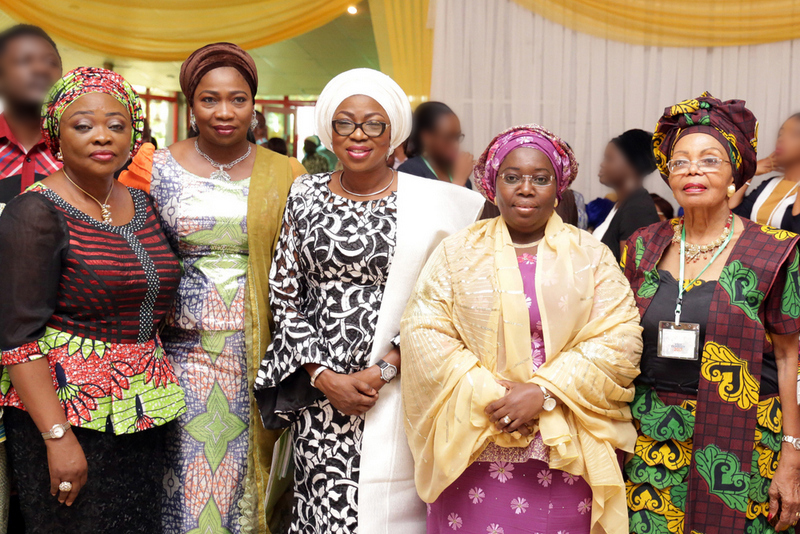 Wife of Lagos State Governor, Mrs. Bolanle Ambode (2nd left); representative of the Governor and Deputy Governor, Dr. (Mrs) Oluranti Adebule (2nd right); Commissioner for Women Affairs & Poverty Alleviation (WAPA), Hon. 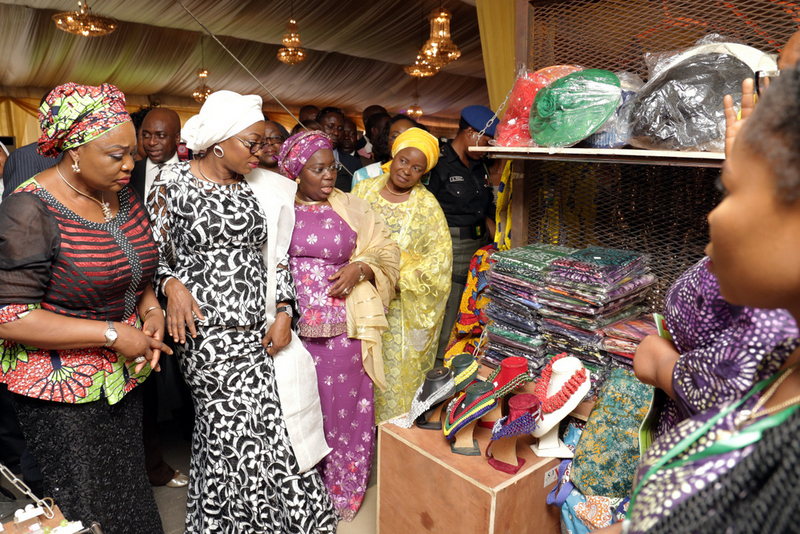 Lola Akande (left) and Alhaja Fatima Bintu Tinubu, inspecting exhibition stands during the 2017 WAPA Connect Conference, with the theme “Fostering Domestic Harmony Through Multi Perspective Analysis & Graphic Display/Entrepreneurship in the 21st Century”, at the 10 Degrees Event Centre, Billings Way, Oregun, Ikeja, on Thursday, 8 June, 2017.Thursday, 8th June, 2017. Wife of Lagos State Governor, Mrs. Bolanle Ambode (middle); representative of the Governor and Deputy Governor, Dr. (Mrs) Oluranti Adebule (3rd right); Commissioner for Women Affairs & Poverty Allievation (WAPA), Hon. Lola Akande (3rd left); Lagos State Head of Service, Mrs. Olabowale Ademola (2nd left); Senior Special Assistant to the President on the Diaspora, Hon. Abike Dabiri-Erewa (left); Mrs. Funmilola Ajayi (2nd right) and Barr. Laide Osiji (right) during the 2017 WAPA Connect Conference, with the theme “Fostering Domestic Harmony Through Multi Perspective Analysis & Graphic Display/Entrepreneurship in the 21st Century”, at the 10 Degrees Event Centre, Billings Way, Oregun, Ikeja, on Thursday, 8 June, 2017. Wife of Lagos State Governor, Mrs. Bolanle Ambode (middle); representative of the Governor and Deputy Governor, Dr. (Mrs) Oluranti Adebule (2nd right); Chief (Mrs) Opera Benson (right); Commissioner for Women Affairs & Poverty Alleviation (WAPA), Hon. Lola Akande (left) and Senior Special Assistant to the President on Diaspora, Hon. Abike Dabiri-Erewa (2nd left) during the 2017 WAPA Connect Conference, with the theme “Fostering Domestic Harmony Through Multi Perspective Analysis & Graphic Display/Entrepreneurship in the 21st Century”, at the 10 Degrees Event Centre, Billings Way, Oregun, Ikeja, on Thursday, 8 June, 2017.Thursday, 8th June, 2017.